You know that investing is a smart move: It's a way to grow your wealth over time and boost the odds that you'll have enough money to live the happiest possible retirement. 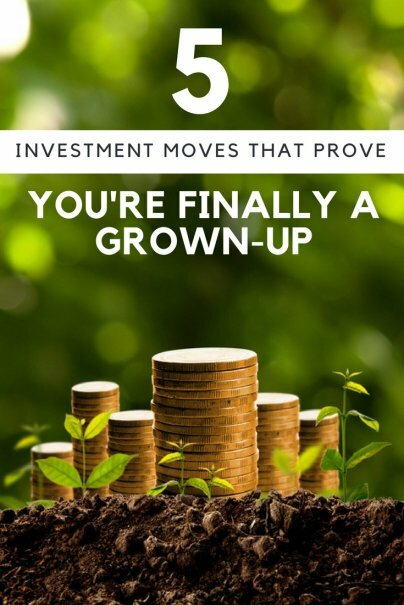 But how do you know when you're investing your money like a grown-up and not like a kid? It's about taking reasonable risks, doing your research, and changing your investment mix when it makes sense. In other words, you know you're investing like a grown-up when you treat investing like what it is: work. These are the five investment moves that prove you're finally a grown-up. It's true that stocks come with more risk. But investing in stocks comes with the potential for much higher rewards, too. If you ignore stocks and only invest in safe assets such as bonds, you run the risk of losing significant profits over time. According to TIME Money, since 1926, portfolios made up mostly of stocks have never had losses that last 20 years or more. These same portfolios reported average gains of more than 10.8 percent annually, while portfolios made up of bonds averaged returns of just 4 percent a year. Your friend comes to you with a hot tip, claiming that you absolutely must invest in this new company. They tell you you'll be getting in on the ground floor of something big. An immature investor might jump at that opportunity, but a grown-up will do the research before acting on the tip. It's tempting to sell a stock when it's either soaring in value or falling. But reacting too quickly to changes in value, whether positive or negative, is the sign of an immature investor. The grown-up investor realizes that investing sometimes requires patience. Consider a stock that rises in value after you buy it. Sure, if you sell it, you'll make a quick profit. But what if you held onto the stock longer? If the stock is a solid one, it might continue to increase in value over time. If you sell too early, you might miss out on plenty of future profit. You don't want to overpay for stocks, but sometimes investing in a quality company takes a significant amount of money. Grown-up investors know that it's better to invest in a strong company while paying a bit more than it is to get a bargain price for a company that won't perform as well. The truth is, if you want to invest in top companies, you'll have to spend more to do so. Don't let your quest for bargain prices trick you into investing in underwhelming companies. When you change jobs, you'll usually have to figure out what to do with the 401(k) plan in which you've been investing. The immature move? Cashing it out for a quick buck. The grown-up move? Rolling that 401(k) over into an IRA. If you cash out your 401(k), you'll lose a good portion of the money you saved because of taxes and, depending on your age, penalties for withdrawing the cash too early.